One of my favorite things about summertime is the farmers markets and fresh veggies. Turing fresh produce into perfectly preserved cultured veggies makes me so happy, but it wasn’t always that way. When I was growing up, every summer my mom and her friends would can the produce from our garden. They would heat up the house for days with canning and sterilizing jars. The house will get so hot that I would go to a friend house to escape the heat. I did love one particular thing that my mom would can. It was a summer squash relish. I would eat spoonfuls of this stuff and have it with my sandwiches everyday and craved it. I found my mom’s old recipe and decided to culture it. No canning, just chop and place in jars and ferment. Doesn’t get any better than that. It is still one of my favorite condiments and it taste just as good as my mom’s. 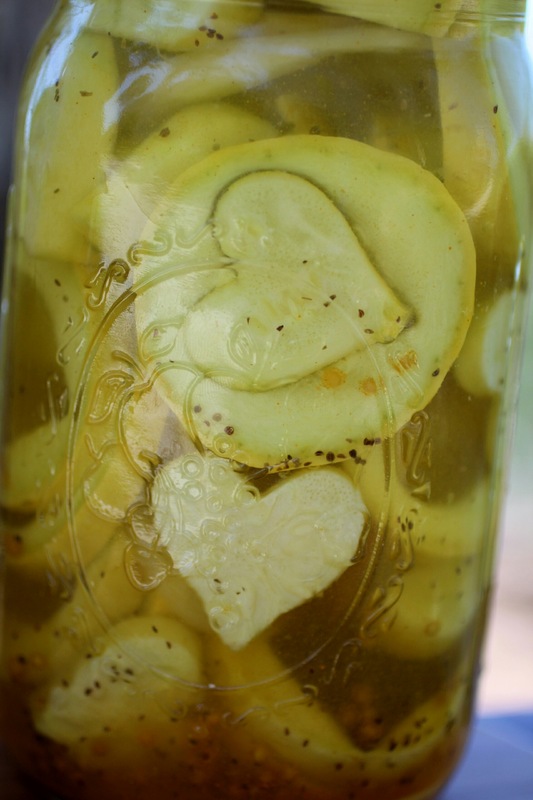 It’s a great way to use your summer squash and on top of that it is a fantastic probiotic food. It also makes me very happy to see the jars in my fridge and reminds me of my mom. Yellow squash is a brilliant source of vitamin C and a very good source of magnesium, vitamin A, fiber, folate, copper, riboflavin, phosphorus, potassium and it is high in manganese. 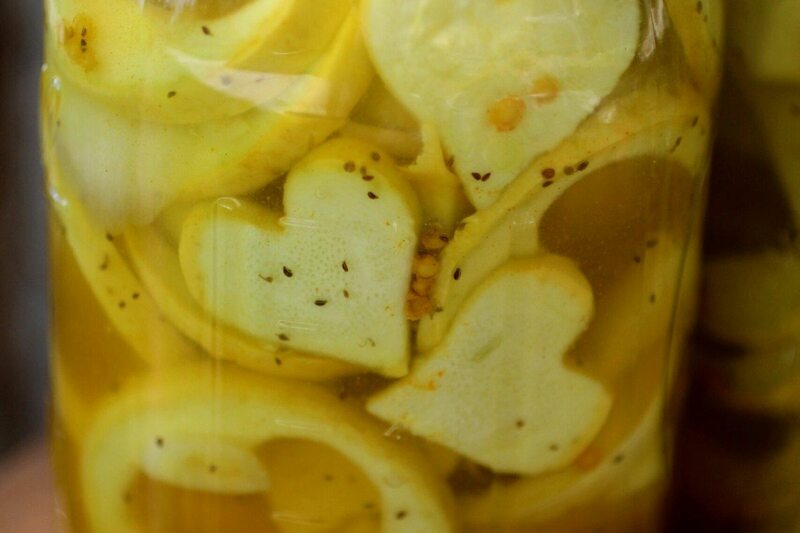 Cancer Prevention Yellow squash is abundant in antioxidants that keep free radicals at bay. With its high beta-carotene content, yellow squash is a great source of protection from pollutants and chemicals that lead to cancer. Also the high vitamin C content is what helps prevent premature aging and cancer as well as inhibiting cell division. I use the spice Turmeric in this recipe and turmeric is one the most thoroughly researched plants in existence today. In a five-year long research project on this sacred plant has revealed over 600 potential preventive and therapeutic applications, as well as 175 distinct beneficial physiological effects. I also use Honey in this recipe. Many people think you can’t use honey in fermented foods because it is anti-bacterial, but actually it works very well with the addition of a culture package. The honey gives the good bacteria food to eat, and keeps the culture active longer, because it has a steady supply of food. It seems like a lot of honey but the cultures eat the honey and make probiotics from it and to keep this a sweet relish you have to add a lot. Those good bacteria will eat all the honey over time as it keeps fermenting. This is the wonderful thing about probiotic foods, the good bacteria keep things in balance as you ingest them. They help consume sugars inside of you as well as the food. 47 Responses to "Claire’s Cultured Squash"
This sounds delicious! I was wondering, since we are in the throws of winter here in Wisconsin, could I use winter squash? I still have a few butternuts and acorns from harvest but I have never attempted to ferment these kinds of squash. Thanks! This recipe sounds great and I will delinitely try it. I was wondering canit be mixed with some cabbage? One more question Donna, please. I have been enjoying making the kefir cheese ans so I have lots of whey left. Other than usings it in culture veggies and I hane made few can the whey be used in smoothees or other ways? Hi Donna, I would like to use some cane sugar in place of the honey, maybe half and half. Would you use 1C sugar in place of 1 C honey? I was not sure if honey and sugar were the same sweetness or if I should use less. I made the first batch with honey and it was soooo good, but honey is $13/qt here. It was 10 last year! Yes, you can do this but I have never done it but others have with success. It’s great in salad dressings! Recently I received an email from you for sliced cucumber pickles with leaves for crispiness. I have looked everywhere on your site and cant find it. I just tasted my first batch and they are delish. I would like to make it again. Can you please tell me where to find it? I’m so excited for this recipe! I’m also so glad you gave us a recipe using honey. I’ve been wanting to ferment some cherry tomatoes with ginger and cinnamon and I wanted it to be sweet, but didn’t know how to do that. Now I have an idea. Thanks! I would recommend using the Caldwells starter packages instead of kefir whey which is dairy free. Whey is from milk kefir and I would not use water kefir to make cultured vegetables. Could you please tell me why you don’t recommend using water kefir as a starter culture. I have been using it to make sauerkraut and haven’t noticed any problems with it. The starter cultures have different bacterias and the ones in the starters will make the good bacteria last longer and stay at a higher level longer after fermented. I love fermented foods, but storage in my fridge is becoming an issue. I know that people have been fermenting for hundreds of years without the use of refrigeration. Any takes on using alternated storage? I live urban and don’t have the option of building a root cellar but I do have a basement that stays at least 10 degrees cooler than the outside temps. So far this summer we are staying close to 100 degrees during the day. Any storage ideas would be appreciated. For those of us who are dealing with candida, is the honey OK? I certainly appreciate all of the recipes you share. It has opened a whole new way of healthy eating to me. I am not a fan of using plastic and I don’t worry much if they float up above the water. They calm down once in the fridge and the airlock system is the best if you are worried about them being above the water. I use a cabbage leaf to cover the vegetables and a carrot stick (cut to the appropriate size) under the hole for the lid to keep the vegetables down. It works amazingly well! Can I use zucchini instead of yellow squash? It doesn’t taste the same but you can try it. There is 1031 calories in a cup of honey,multiply by 2….. wow that’s a lot and expensive too! The cultures eat a lot of the sugars and you have to use a lot to make it sweet because they keep consuming it, but they also make probiotics from the honey, so its a great way to have a sweet pickle relish because the probioitcs keep you in balance. Yes you can do this and I think it would work as well. Can I use whey from straining yogurt or making cheese in place of the kefir whey? Yes, but you have less probiotics. I have a white spot on the top of my kombucha. What are your thoughts on this? Is it the scoby forming another scoby? This is normal. Can I use sucanat instead of honey? If I can not get cultures now and don’t have liquid whey, can I add extra salt? If so, how much? I have not this recipe with out a culture and with the added honey I’m not sure it would work. This sounds yummy and I’m not the biggest fan of yellow squash. Do you ever make it chopped up fine, like a typical relish or is it always sliced? I just used honey in a ferment for the first time last week. I put some in the brine of a jar of thinly sliced ginger, with a few Szechuan pepper corns tossed in for grins. Keeping my fingers crossed! I love pickled ginger. Lastly, just a FYI for you and your readers, both green and yellow summer squashes are often GMO so if you are trying to avoid GMO, buy organic. If you grow your own squash buy heirloom seeds to be sure they’re nonGMO. You can chop them up into relish. Thanks Donna! Can you tell how many jars (and size) this recipe would yield? 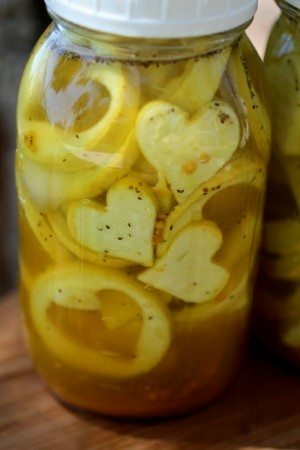 2 Quarts jars for this recipe. As JennE asked on May 6th what is the preferred temperature if not storing in the fridge? I too have a cold cellar. What time period can the fermented veggies be kept in the fridge? I am new to the fermenting process. Have just planted my garden and am anxiously waiting to try these recipes. The exact temperature depends. After the initial fermentation you can place them in a cold cellar where they may ferment still at a higher rate than the refrigerator, but the cooler temperatures will still slow it down enough that it will be fine. I was wondering do I have to refrigerate all of the items that are cultured? I have a room in my house that stays quite cool all year round I was wondering if I could just store all my non-fruit cultured veggie and veggie products in there. This sounds wonderful! I’m gonna give it a try, but wanted to be SURE — 2 cUPS HONEY?? Seems like a lot! Thanks, Donna! Yes, it’s a sweet relish and a lot of the honey gets eaten.